SIMPSON BAY, St. Maarten (Dec 8, 2013) For the second time this year, young dancers performed the flash mob dance, this time as part of the celebration of the 70th anniversary of the Princess Juliana International Airport (SXM), which had kicked off on December 3, with the Anniversary Symposium at the Westin Dawn Beach Resort & Spa. 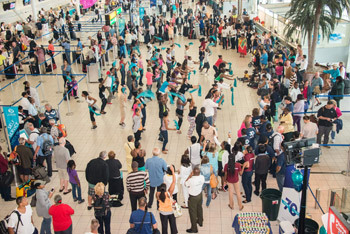 If the first flash mob dance took arriving passengers by surprise, last Saturday’s performance grabbed the attention of departing passengers and airport workers, although quite a number of visitors who had just arrived were seen dragging their luggage toward the Departure Hall where the dance took place, drawn by the music and the milling crowd. But it was not visitors alone that enjoyed the performance and received branded gift items as well as drinks and snacks; many people of St. Maarten/St. Martin – some who came to welcome or see off friends and family, and employees at various establishments at the airport – said they were pleasantly surprised and impressed. “Although it was raining and kind of cold outside, this was a very warm and beautiful contrast,” said one employee. “Our aim was to create a festive mood and offer an entertaining atmosphere for all users of the airport,” noted LaBega, obviously satisfied at the public response to the event. 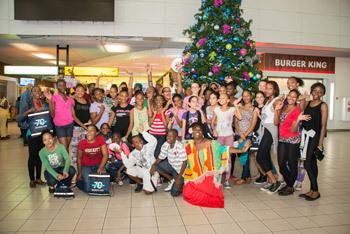 “It is our way of saying ‘Thank You’ to everyone for making SXM Airport what it is today.